Ages 10 through 17. Motivate your students to think, use their knowledge of language, and write using the high-interest activities in this book. 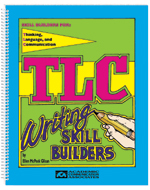 The activities require short written responses and are great for students with attention deficits.